See J3373 : Car park, Belfast. Part of the same ground-level car park. There is an application for planning permission “1453/F 19 to 37 Grosvenor Road , and lands to rear of 19 to 37 Grovenor [sic] Road , Belfast Amendments to approval for multi storey car park (645 spaces) and taxi offices (ref Z/2003/3008/F) to facilitate internal alterations and one additional parking deck to rear. Total spaces 616.” Previously a long-established car hire business. 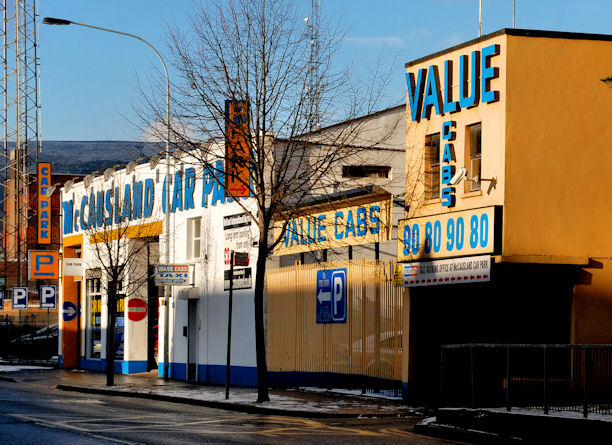 100 years ago the row included the Belfast Carriage and Van Works - F. C. Johnston, J.P., proprietor and the Belfast & Glasgow Boot Repairing Co.
A former car hire and, later, privately-operated public car park now with a (complicated) planning permission (26 March 2007) “Z/2003/3008/F Erection of multi-storey car park building (645 spaces) and office accommodation for taxi business (650 sq.m.). 19-37 Grosvenor Road & lands to the rear of 19-37 Grosvenor Road, Belfast, BT12 4GR”.